In September 2012, celebrity nutrition and fitness expert JJ Virgin was in a great place in her life. She felt life was perfect. She was taping a PBS special, booked on TV and media, and had a book launch lined up. Any parent would understand that “letting go” simply isn’t an option. She was determined to prove the doctors wrong. She reached out to friends and colleagues, and wrote a letter to her social media tribe, and asked for support. Not sympathy – support. The response was enormous – from doctors, healers, top brain researchers, and others asking what they could do. He had survived surgery, but was still in a coma. That book debuted as a New York Times bestseller, and the launch made millions. She now has four New York Times bestsellers: The Virgin Diet, The Virgin Diet Cookbook, JJ Virgin’s Sugar Impact Diet, and JJ Virgin’s Sugar Impact Diet Cookbook. JJ’s latest book, Miracle Mindset, shows warrior moms how to be strong, positive leaders for their families, while exploring the inspirational lessons she learned fighting for her own son’s life. JJ is co-host of TLC’s Freaky Eaters, health expert on Dr. Phil, and is a prominent TV and media personality. She has appeared on on PBS, Dr. Oz, Rachael Ray, Access Hollywood, and the TODAY Show and is founder of premier health entrepreneur event and community, The Mindshare Summit. 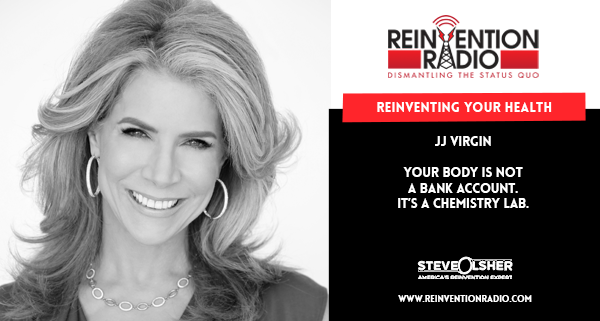 TUNE IN to this episode as JJ chats with Steve, Mary, and Richard about reinventing your health and understanding that your body is not a bank account – it’s a chemistry lab. Reinventing Being Relentless – In this episode, Dennis Langlais chats with Steve, Mary, and Richard about “Showing Up” and becoming a celebrity in your niche market.